As I write this, the Supreme Court has struck down the deeply restrictive Texas state laws around abortion, and it's both a hugely symbolic victory and a real protection for the rights of American women to control their own bodies and futures. It's not just about Texas, it's not just about the conservative judge Anthony Kennedy and his decision to support the majority opinion, and it's not just about the fact that this is the first judgment on abortion by the Supreme Court since 2007, or their first ruling on it since the death of conservative judge Antonin Scalia this year. It's about a wider derailment of the anti-abortion strategy. And that's extremely important. The case in question was Whole Woman's Health v. Hellerstedt, and it was about determining whether the restrictive laws put in place by Texas legislature on abortion providers in the state were constitutional. The laws mandated that every abortion clinic have admitting privileges at a nearby hospital, and for them to have expensive and difficult-to-obtain medical equipment on site. The emphasis was on "patient health," even though, as Vox has pointed out, a huge majority of doctors agreed that the measures were completely medically unnecessary. The clinics which couldn't comply had to close, and the number of abortion clinics in the state plunged from 41 when the law was created in 2013 to 18 today. It turns out that, to the highest court in the land, forcing women to drive hundreds of miles and vastly limiting the amount of abortion providers in a state does actually violate federal law. In other words, states are not only obliged to offer legal, safe abortion; they're also obliged not to stand in the way of people who want one. The job of the Court was to find whether the laws created an "undue burden" on women seeking abortions, and the majority decision decided it did: "Both the admitting-privileges and the surgical-center requirements place a substantial obstacle in the path of women seeking a previability abortion, constitute an undue burden on abortion access, and thus violate the Constitution." But in making this decision, the Supreme Court's also done something very interesting, and potentially seriously damaging to anti-abortion groups. It's left restrictive laws in other states vulnerable, and it weakens the state-based structure of the American anti-abortion movement. The fight around abortion in today's America is all about state laws. In 2015, The Atlantic profiled one of the biggest players on the anti-abortion side of the debate, Americans United for Life (AUL), and documented how their strategy is now about state-based incremental limitations which could eventually whittle abortion access down to nothing. "To AUL," The Atlantic wrote, "the abortion debate is all about tiny maneuvers — which ideally, but not necessarily, will cause abortions to dwindle in the long run." The Texas laws were part of this approach: not an all-out assault played out in the newspapers with gigantic gestures, but on the smaller scale of state restrictions. AUL itself was largely behind the Texas restrictions, vocally fighting against the "extreme abortion-on-demand agenda" supposedly ushered in by Roe v. Wade in 1973. The key point of their strategy, it seems, is that while nationwide abortion access is allowed, states are under no obligation to make it easy for women to access the procedure. Today's judgment throws that perception out the window. It turns out that, to the highest court in the land, forcing women to drive hundreds of miles and vastly limiting the amount of abortion providers in a state does actually violate federal law. In other words, states are not only obliged to offer legal, safe abortion; they're also obliged not to stand in the way of people who want one. This represents a massive wrench in the works of pro-life attempts to derail access to abortion, because it redefines a state's responsibilities when it comes to its abortion-seeking citizens. And it means that other restrictive abortion laws can be vulnerable to the "undue burden" argument around abortion, itself a creation of the Supreme Court in 1992. An undue burden, according to the '92 judgment, is one whose "purpose or effect is to place substantial obstacles in the path of a woman seeking an abortion." Well, that now includes putting punishing, unnecessary restrictions on abortion clinics and providers, and in turn on women, while cloaking them in the rhetoric of "health." Don't let the door hit you on your way out. The previous wave of anti-abortion state-based challenges was based around laws banning abortions after 12 week's gestation — the so-called "fetal pain law." But the most high-profile example in Arkansas was struck down by the Supreme Court in January 2016. Now, with the creation of this "undue burden" precedent, and with some extremely pointed remarks about the failed Texas law from the majority judges (Justice Ruth Bader Ginsburg said it was "beyond rational belief" that the law "could genuinely protect the health of women," while Justice Stephen Breyer pointed out that there was "nothing in Texas record evidence" to show "legitimate interest in protecting women's health"), the anti-abortion camp will have to scramble for something else to interfere in the rights of American women. The next big event in abortion legislation after this monumental day? A Louisiana law which also concerns "admitting privileges" for abortion clinics, which the Supreme Court deliberately blocked in March until they'd made a decision in the Texas case. This looks like the kiss of death for that one, too. It's also amazing news for women in Wisconsin, Alabama, Arkansas, Mississippi, and Oklahoma, all of which have similar "admitting privileges" laws which will likely now be struck down as unconstitutional. So this matters. 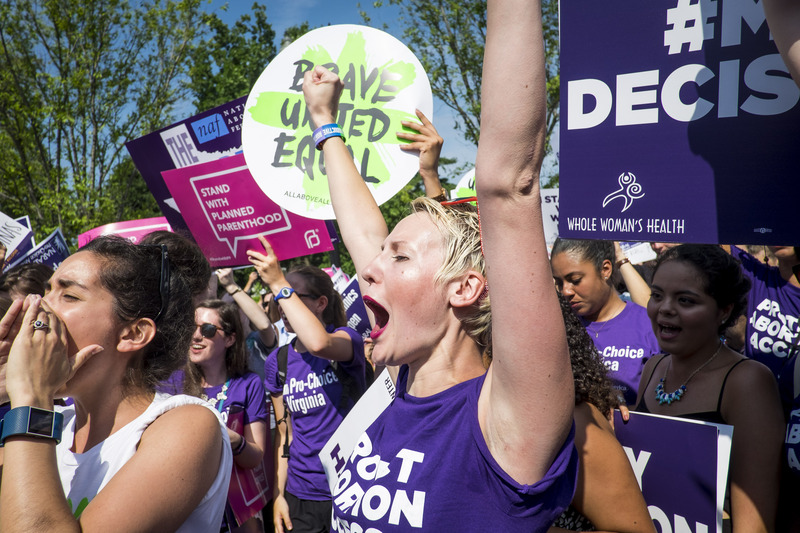 It's one of the biggest victories for abortion rights in decades, and may prove to be a significant blow to an entire strategy of incremental restriction at the state level. You want to take our rights away piece by devastating, deliberate, humiliating piece? Today, that just got a whole lot harder.